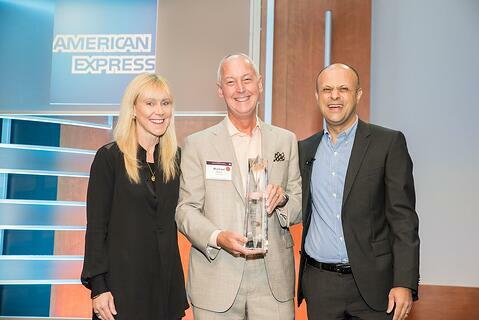 Travelink, American Express Travel, is pleased to announce that during the annual American Express Travel Global Forum, held at the Arizona Biltmore, A Waldorf Astoria Resort in Phoenix, the company was named Agency of the Year. Every year, American Express Travel presents a Representative member with the Agency of the Year award. Agencies that receive this recognition exhibit exemplary values, service and performance. The Agency of the Year award is given to an agency that provides exceptional service and value to customers, always upholding the values and standards of the American Express brand. Contributing to the selection of Travelink for the recognition this year included the company’s unique engagement level for the Gold Card Member travel services program, active participation in several influential industry advisory boards, including American Express Travel, Departures Magazine, Travel + Leisure Magazine, Trump Hotels, Sabre, and ASTA CAC where Michael Dixon, President & Managing Partner of Travelink, was recently appointed to the leadership role of Secretary, serving three successive 2-year terms ending as CAC Chairman. Travelink was also recognized as Agency of the Year in 2011.